Hello and welcome to Golden Daily Scoop, a Golden Retriever Wellness and Lifestyle blog. My name is Kristy and I'm the author/creator of Golden Daily Scoop. 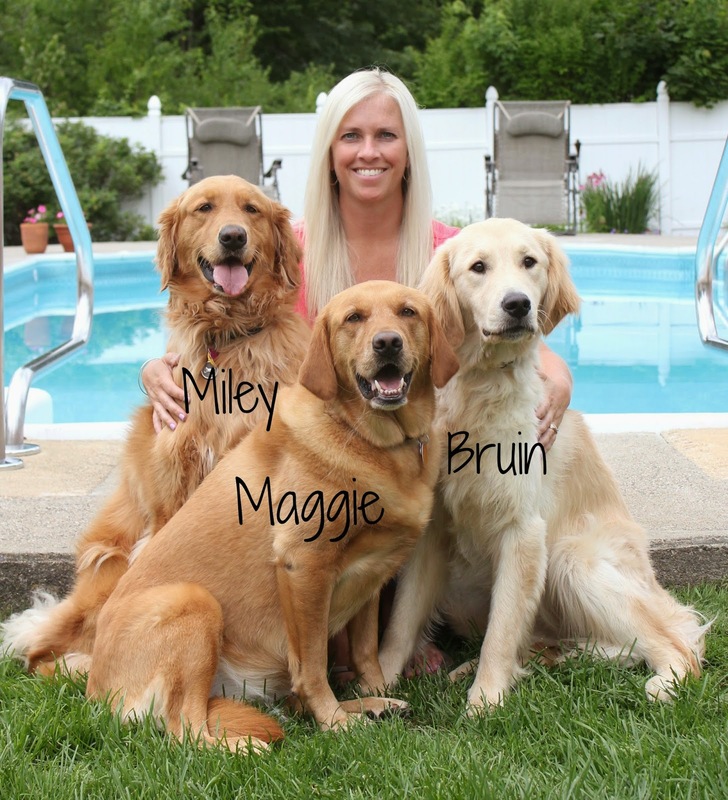 I live in Massachusetts with my husband, two daughters and am a dog parent to three Goldens - Miley, Maggie and Bruin. Miley is my 9 yr old golden who is the leader of the pack. She is the official taste-tester and reviewer here on the blog. When she isn't helping out on the blog she is on squirrel guard and loves to practice her right to nap! Maggie is my 7 yr old golden lab who also enjoys helping out Miley with testing out treats and toys. In her spare time she loves swimming and soaking up sun puddles! Bruin is my 4 yr old golden who is just learning the ropes around here and is really getting the hang of testing out fun new products. Bruin loves to horseplay with his siblings, play fetch and taunt the cat! So why do I have a dog blog? This started out in 2009 as just an online photo album and journal that I started so we could remember how cute Miley was as pup and all the fun things she did and yeah some of the not-so-nice things that we've gone through. Now over six years later, it has turned into so much more. As you can see, our family has grown and we have made many new friendships both personal and professional from all across the world. Today, I love sharing our everyday adventures, cool things we find in the dog world, ways in which my dogs live a healthy and active lifestyle as well as trusted product reviews and giveaways. You can contact me at goldendailyscoop@gmail.com. Please feel free to view my Media Kit and Reviews pages. Golden Daily Scoop is a member of the BlogPaws Community, BlogPaws PetBlogger Influencer Group, the Chewy.com Blogger Outreach Program and a PrideBites PAWtner.